We've known about Facebook's plans to improve the internet for third world countries for a long while now. With Internet.org they've worked on different things and are slowly trying to provide more internet access. However, their Free Basics offering hasn't always gone down well and there's a chance that this will do badly as well. 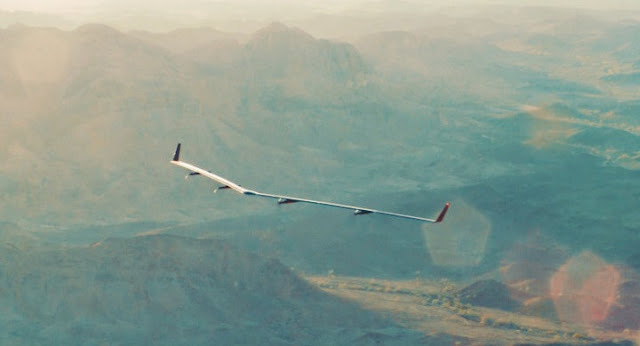 For now, Facebook is just glad to be able to get the drone in the air. Facebook's internet-beaming drone, Aquila, made its first flight over the Yuma Proving Ground in Arizona last month. They didn't try to test its internet capabilities as they're still working on the signalling technology, but they wanted to see if their hard work is paying off. If the drone hadn't have been able to fly then it could have been months more work to be able to get it into the air. But they succeeded and the drone that was only supposed to be up in the air for a 30 minute period stayed up there for 96 minutes and flew 25 miles per hour at 2000 ft. This was better than the staff expected so this seems like it's a good sign. Aquila is more of an internet-beaming aeroplane than it is the typical drone. Its wingspan is larger than that of a Boeing 737, but it's a third lighter than an electric car and is slower than the average jet so it can endure being in the sky for long periods of time. The Aquila is supposed to be up in the air for up to three months at a time and due to this reason they've made it solar powered so it can stay up there and not need too many maintenance stops. The drone isn't something you're going to miss in the sky, but it won't be providing the internet for people who can see it. The drone wants to provide the internet to a lot of different people and due to that, it will need a wide reach. Even though the drone is now able to fly, it will still take two years for this drone to be ready to provide the offered service. Facebook are getting though and if they address the issues users have with Free Basics, then this could actually be a really important step for the future of the internet.